← Feeling alive at five!!!!! In April 2012 I ran the Chi-town half marathon in 1:38 which qualified me to get into the NY marathon. I had never entered the lottery to get in but had always wanted to do it. It has been on my list for a long time. I had already signed up for Chicago at that point but decided to make a trip of it and make it a fun run. The race goes through five boroughs of New York. What better way to see a city than to run through it. I had been to New York but never Brooklyn, Staten Island or Queens and had only been in the Bronx to see the Yankees. Needless to say I was really excited about it. I came out of the Chicago marathon feeling pretty good that I had run better than I thought I was going to. I did a few medium length runs and some strength training leading up to NY after Chicago. I wanted to make sure that my legs were well rested for NY. I didn’t care about my time but I didn’t want to be absolutely miserable either. So of course as you all know Hurricane Sandy slammed into NY and the East Coast the very week of the marathon. Airports were shut-down, power was off, people were flooded and some died. It was very tragic. I stood by the TV watching as people were being forced out of their homes. First, I wasn’t sure if I wanted to run it and second, we were not sure if we were even going to be able to fly in. LaGuardia was the last airport to open on Thursday, the day of our flight. The talk began on whether or not the marathon was going to be cancelled. I was very torn about the whole situation but assumed that the people who were making the decision ultimately knew best. Even on Thursday morning as I was packing watching the recovery efforts on the TV I cried. We kept an eye on the flights and it was on time. We arrived on time in New York at LaGuardia on Thursday November 1st. I had just filed our financials at work and was very stressed about the race and if/how it was ever going to happen. How do I run through these areas and enjoy it while people don’t have electricity? We took a bus and train to midtown. It was a long wait, the bus was packed and people were yelling at each other. Stressed! Other than that it went smoothly. Mid-town and Broadway seemed business as usual-Tourists walking around, entertainers on the streets, packed restaurants and busy full bars. I though oh, I guess it will be ok after-all. Whenever we were out I spoke to as many locals as possible, just to get their opinion. Most, despite being out of electricity said it was ok, some said it should have been cancelled. Our friends Jamie and Scott who live there didn’t seem to mind. Scott, a paramedic and Jamie, a nurse were no strangers to disaster in New York. Facebook was a frenzy of opinions. I took the opinion that I would do what the city wanted, if the city (i.e. 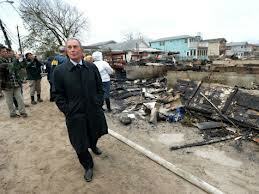 mayor) wanted people to come to the city and run then I would. Friday, came and we walked to the expo. Down near 34th and 12th at the Javits convention center. I picked up my race packet. Like any expo it was full of runners and lines for everything. You couldn’t help but notice all the foreign accents. Thousands of the 47,000 expected runners were from overseas (as many as 20,000 runners are international) I looked at the official race merchandise and spent about $70 on a t-shirt and arm warmers as a mo mento.We left the expo and walked through Hell’s Kitchen and ate at 5-napkin burgers. We sat beside a guy who worked for Nike. He had ridden his bike into the city 17 miles for an event then was going to ride it home again that evening after the event because he had given up his room to a friend with no electricity. He was upset that the marathon was still going on but as I expressed how bad I felt he told me not too. After our late lunch we walked back to the hotel room with my race bag. I did my normal thing and dumped everything out sorting between keep and throw away. I turned on the TV at about 5:00 pm or so and saw the banner on the bottom. New York Marathon Cancelled. I thought it was some joke, I seriously stared at the TV for some time reading it and re-reading it. I called Tom over just to make sure I wasn’t seeing things, I told him that it was cancelled, we both sort of stood in disbelief. Finally the newscaster came on with the “breaking” news. I of course posted it on FB right away and sure enough people came back saying the same thing – and since if it’s on facebook it had to be true 🙂 it finally sank in. It was cancelled and that was that. The first cancellation in 42 years, not even for 9/11 was it cancelled. I was not upset about it being cancelled I was upset that they waited so long. We would not have made that trip if it wasn’t for the marathon. For the money we spent we could have stayed at an all inclusive 5 star hotel in Mexico which would have been luxurious! (Sorry if this sounds selfish, I have done my fair share of mission work so I’m non completely oblivious to disaster and people in need) I love New York but 5 days is a lot of time there. We made the most of the trip. We had fun hanging out with our friends Scott and Jamie, we went to see a Broadway show with Al Pacino which was cool and we ran in central park several times. I had never really done the full 6 mile loop, the weather was cool but sunny most days, perfect running weather. The full 6 mile loop is quite hilly but very pretty, hard to believe it’s in the middle of Manhatten. We walked to the East side on Sunday (marathon day) through the park and saw 1,000’s of runners running “Plan B” the marathon that did 4 and bit loops around the park. There was even people cheering the runners on and mini-aid stations. 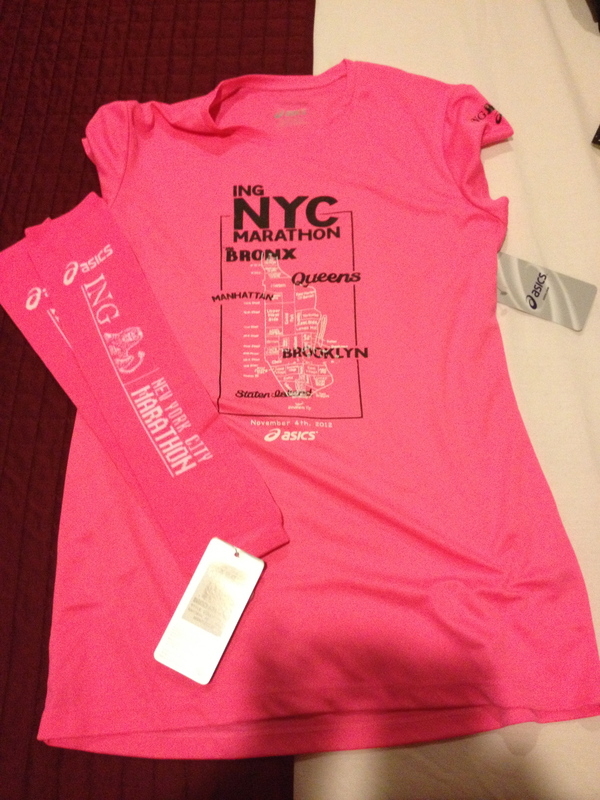 If NY’ers want their marathon – they will get it! Ironically we ended up in at a bar watching the Bears game. The next day I did two loops of the park and also saw several other runners doing multiple loops. There was definitely a sort of camaraderie on the streets of New York between people who looked like runners or were wearing their orange marathon shirt. I wore mine for my run on Monday. I am sure for those runners who had trained hard for this particular race they felt like they needed to do it. 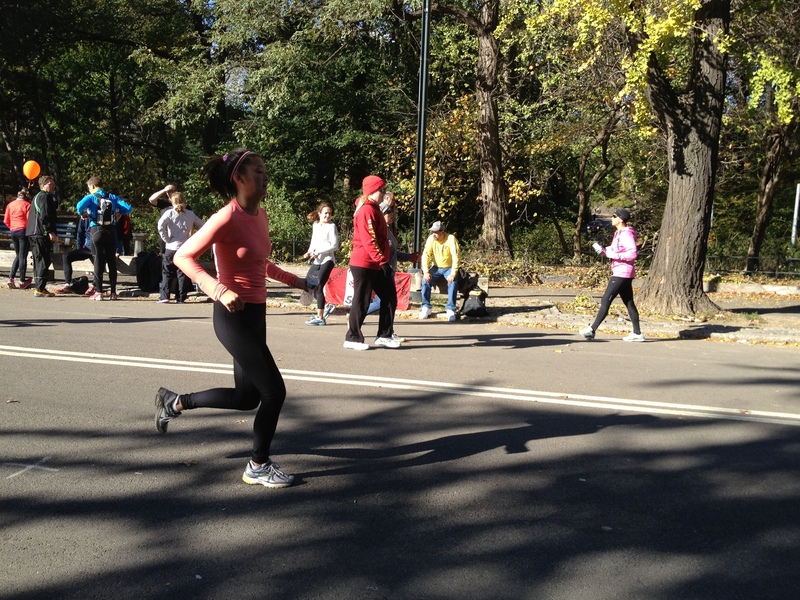 Other runners went to Staten Island to help with the relief effort. It isn’t confirmed but I believe we have guaranteed entry into it next year but I can’t do it because I will be doing the Arizona IM 2 weeks later. Hopefully they will extend the entry to 2014 :). I just want to run the New York marathon, some day and make this finish line picture real. Dear Runners,Thank you for your patience and understanding during this difficult time in New York City. The cancellation of this year’s marathon was an unprecedented event, which we know has left many unanswered questions for all of you.Please know that our priority is to address your concerns. We ask that you give us a little time to work out the details and make thoughtful decisions. We are very grateful for your continued patience.We will do all that we can to have these issues sorted out in the coming weeks. The NYRR rakes in $22M in entry fees, $10M from sponsors and $8M in dues then spends about $22M on the marathon, $13M in wages and benefits and $9M on advertising and other races. Wettenburg alone makes over half a million a year, not bad for a race organizer. Apparently this does not translate into fast thoughtful decisions. 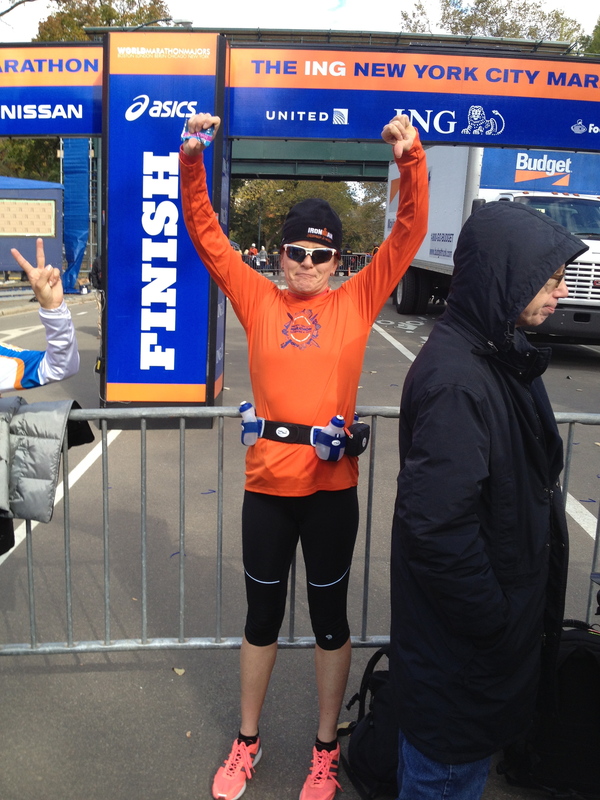 This entry was posted in Race Reports, Training, Uncategorized and tagged marathon training, NY Marathon. Bookmark the permalink.